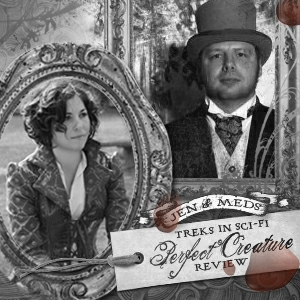 This weekend on the podcast we have guests hosts Jen and Meds to take you on a journey through the film called the “Perfect Creature.” They cover this Steampunk/Vampire movie with lots of fun and laughter for all of you. I will let them share a few comments about this podcast. Jen from Anomaly and Meds from Waffle On guest host this edition of Treks In Sci-Fi. They discuss the Steampunk/Dieselpunk Vampire film entitled: Perfect Creature. This review is loaded with humor and information on a movie they say is entertaining, but suggest you rent rather buy. I want to thank both of them for taking the time from their busy lives to do this special guest podcast for all of us. Awesome job! Tune in next week on TSF when I will be covering the recent Motor City Comic Con I attended along with some recent movie reviews and other geek-tastic topics! Take care and enjoy your week ahead. P.S. And make sure to check out our new Facebook group for “Treks in Sci-Fi.” Join us for some social interactive fun!